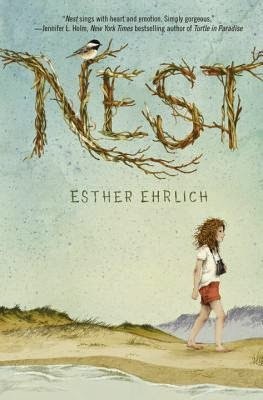 I had heard that Nest by Esther Ehrlich was a sad book, and it's true. This was probably the most dismal middle grade novel I've come across. Beautifully written, but it's dark. Chirp's mother has an illness that will never get better, and it's affecting the entire family. Her psychologist father is trying to hold things together, her older sister is going to adult parties, and Chirp tries to make her mother happy. She's too young to understand that choreographing dances and baking pies can't touch the sadness of depression. Ehrlich makes you feel for the characters. Poor Chirp and her friend Joey, the bad kid from a bad family, just want to be normal children, but the odds are stacked against them. Joey, in particular, was just a raw wound of a character. I wanted to bundle him up and bring him home with me. Unfortunately, we don't get to write the endings to the books we read. In my classroom, I post the covers of all the books I read, so I know my students will ask me about Nest. I am hesitant to recommend this book to anyone--I don't know many fifth graders who like to be sad and finish a book feeling unsettled. Still, it was well written and any book written in Cape Cod gets bonus points from me.